The architecture of temples has interesting and sometimes controversial history. Quite often the novelties and fundamentals of movements in architecture started with the building of temples with sophisticated design. The Polish Roman Catholic churches are rather bright in their beauty. The location of the church amazes with its beauty and picturesque essence. However, what is more wonderful is that architecture of the detailed and sophisticated church does not follow the nature but is likely to add some patterns into its presence. It penetrates the common view enforcing the natural sound. At this point Las Lajas does not run out of the beauty as it goes to the spiritual realm as there have been the true wonders of treatment. Is it God who rules it all? 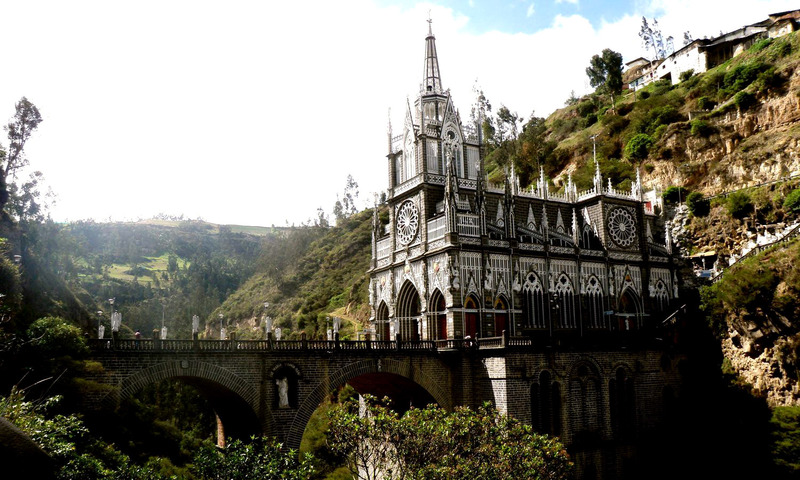 Neogothic church is the basilica built on the bridge in canyon of The Guáitara River. There is some symbolic meaning in it. Actually, Las Lajas is situated nearly on the border of Columbia (in seven kilometers from Columbian city Ipiales) and Ecuador. It became the merit of peace between the neighboring nations. The wonderful story is connected with the way how this temple appeared at this place. Earlier, according to the legend, it was the cave which is famous for the terrible mystical events and local people try to keep away from it. However, in 1754 some wonder happened. A poor Indian woman Maria Mueses had a vision of Virgin Mary in the guise of image on the wall of cave. When this rock carving that wasn’t made by the human arm was seen by the deaf-mute daughter Rosa she got recovered. When the girl contracted some mortal disease and died, the afflicted mother came to the image of Virgin Mary again, and Madonna gave her a resurrection. Such an event could not be hidden. Then, the pilgrims from two military countries came with the desire to ask the healing icon for help. This picture has been saved till now, but currently it is concealed outside the walls of a beautiful temple. Firstly, in the canyon the little chapel was built, afterwards two temples appeared. Even they could not have enough space for everybody who wished to pray to the Divine Mary. Particularly, in 1916 due to the huge financial contributions of parishioners the building of the huge temple began. Outside it resembles the castle-fortress uniting the sides of a deep ravine. But the most important is that the icon on the stone is still well-known for its healing power. To approve that, there is a huge number of the tablets with the gratitude from thousands of cured pilgrims. The petroglyphic Madonna is able to save from many troubles, not only illnesses but also drug addiction, tendency to adultery, etc. The Church of Holy Mother in tears, the Church of Madonna dele Lacrime is situated in the beautiful resort city Syracuse in Italy. It had been built occasionally, on the inclination of the wonder. Once on the place of church it was the house of the usual family which used to pray to the gypsum statue of Madonna. In 1953 tears started running from her eyes. In Catholicism it is considered as one of the wonders and highest divine signs. The legends about the wonder quickly spread in the neighborhood attracting in the house the crowds of pilgrims from all the corners of the world. The local citizens understood the necessity and responsibility to build here the true sanctuary for religious people as the gratitude to the Supreme God. Apart from the wonderful origination, The Church of Holy Mother has quite an interesting architecture. The high building visible from any points of Syracuse (74 meters) has the form of tent or cone. Even though the local people playfully called it as the giant juicer, it is quite high in the direct and metaphoric senses. Its clothes does not contain any precious metals and floridity in the decorations traditional for the temples. 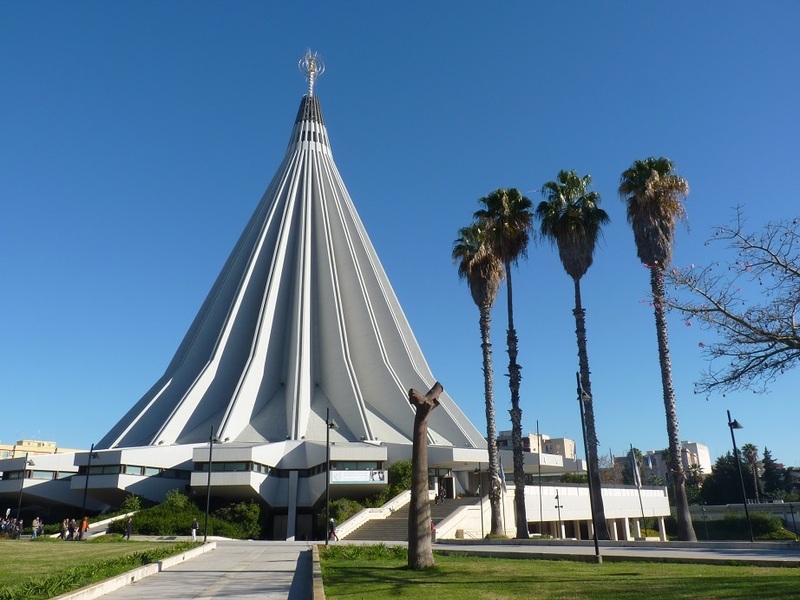 The Church of Madonna delle Lacrime is built from the white concrete and only on its top there is 20-meter statue of Virgin Mary from bronze. Madonna who cried with the real human tears is situated over the shrine in the middle of the temple. Totally, such a concept has the purpose to show the symbol of human rising to the God. This project used to be considered arguable that’s why its building was not favorable. On the opposite, the building of the church took nearly 30 years. For the first time the doors of the temple were open for the pilgrims in 1994. Inside it is as unusual as outside. This is a right round building with the cone decorated with the huge spherical cutting-out from which the beams-rays are going. Visually it resembles the sun. There is an atmosphere of cosmicality and broken reality, however, everything is quite simple and without the decorations. One more peculiarity of the Church of Holy Mother in tears is that three showpieces are functioning there. The Museum of lacrimation, Museum of tribute (here the pilgrims carried the gifts to the tearful Madonna including different female items, such as wedding dresses, jewellery from the silver and other decorations) as well as museum of festive clothes of the churchmen. 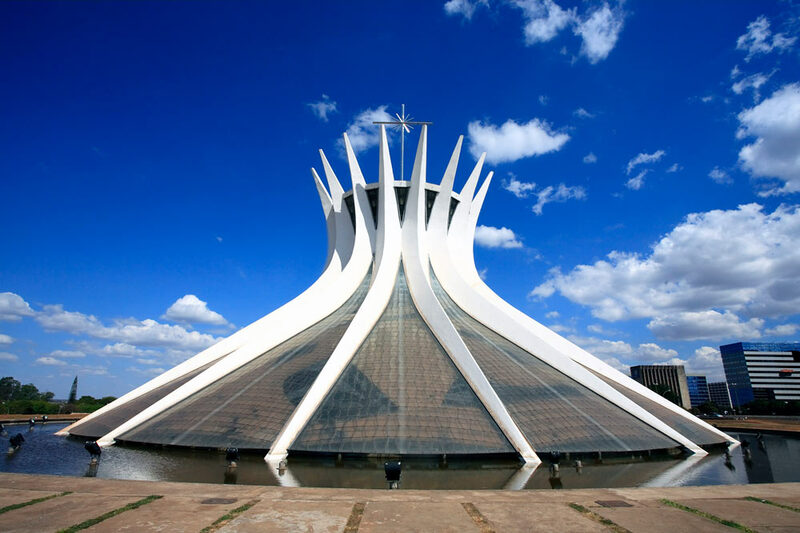 This Cathedral Catholic church in Brasilia city (the capital of Brazil) is the embodiment of charm, airy lightness, and sophisticated simplicity. It was built in 1970. Unbelievable construction with the height of 40 meters is the bright example of modernism in architecture. The church consists of sixteen hyperboloidal columns of a crooked form that are connected with the stained-glass windows. In total, the construction embodies the arms raised to the sky. The inner space is enlightened what creates the sensation of the special spirituality and flexibility even enforcing the spiritual enlightenment after the visit of temple. So as to enter the main building of the Church of Saint Virgin Mary of Aparecida, you should go through the long dark corridor what is going to strengthen the effect of ‘enlightenment’. The author of the unique project is Oscar Niemeyer. In 1988 his work was remarked with the Pritsker premise for innovative nature of the ideas.